In the Second Letter to the Corinthians Paul is addressing some concerns in the community as he prepares a trip to visit them. In the section of the letter that includes the quoted verse Paul is encouraging the people in the community of Corinth to avoid whatever could lead them away from God. Particularly he says avoid unbelievers, those whose values and way of life differ greatly from the Christian life, he is particularly concerned about idolatry. Paul includes some promises from God taken from the Hebrew scriptures; God promises to live within them, God will receive them if they separate and touch nothing unclean, God promises to be their Father and they His children, showing God’s intimacy with His chosen people, His family. Referring to these promises in the quoted verse Paul says let us cleanse ourselves from every defilement of flesh and spirt. Referring to a purity action the people would understand, he wants a cleansing of anything that leads to sin, for the complete person; spirit and flesh. 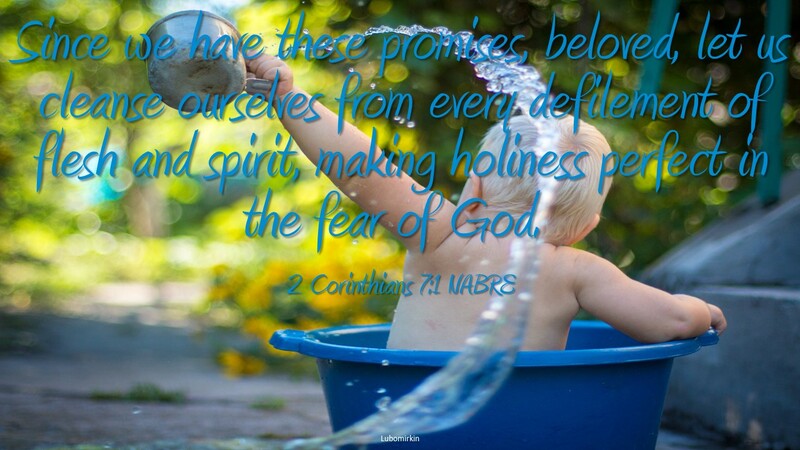 We as people of God should continue to strive toward growth in holiness, taking on more and more the character of Jesus out of reverence and awe of the one who is Holy. This advice is as valid today as it was when originally spoken to the people. We should avoid things that will lead us away from Christian values, away from a community of believers, away from God who wants us to be a member of His family. When we do come in contact with sin we should confess and purify ourselves and work toward being more like Jesus in our whole being. What in your life is not good for you? How can you cleanse yourself of improper behavior and activity?